Vagrancy is the condition of being a vagrant, defined as a person, usually poor, who wanders from place to place without a home or regular work. They are often called homeless people; urban vagrants are commonly called "street people." Some towns have shelters for vagrants. Vagrancy was a crime in many European countries, but most such laws have been abandoned. Legally, a person with a source of income is not a vagrant, even if they are homeless. While societies have made efforts to deal with the large numbers of homeless people that emerged since the Industrial Revolution and urbanization, the problem has continued into the twenty-first century. Resources, including shelter, food, public health care, and even sources of income have been made available in many cities. Yet, large numbers of people, unable to deal with the stresses of employment and maintaining a home, remain on the streets. To solve this problem requires effort on the part of all people, not just official government-sponsored programs. People are essentially social beings, and when they have no successful human relationships, within their family, peers, neighbors, or colleagues at work, they cannot function in society. With the breakdown of the family concurrent with the growth of large cities, people become lost and lonely, lacking support, and eventually fall by the wayside into the streets. Removing them from the streets is not done by building them institutions, but by embracing them into loving human relationships. A vagrant is a person with no permanent home or employment. Vagrancy is generally used interchangeably with homelessness. Homelessness refers to the condition and societal category of people who lack fixed housing, usually because they cannot afford a regular, safe, and adequate shelter. 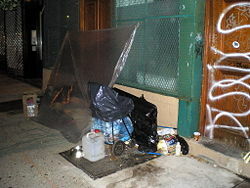 The term "homelessness" may also include people whose primary nighttime residence is in a homeless shelter, in an institution that provides a temporary residence for individuals intended to be institutionalized, or in a public or private place not designed for use as a regular sleeping accommodation for human beings. 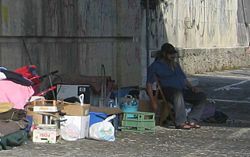 A small number of people choose to be homeless nomads, such as some Roma people (Gypsies) and members of some subcultures. The term used to describe vagrants in academic articles and government reports is "homeless people." Popular slang terms, some of which are considered derogatory, include: “tramp,” “hobo” (U.S.), “transient,” “bum” (U.S.), “bagman/bagwoman,” or the wandering poor. The term (of) "No Fixed Abode" (NFA) is used in legal circumstances. Sometimes the term “houseless” is used to reflect a more accurate condition in some cases. A small number of homeless people choose to be homeless, living as nomads, a way of life in many cultures for thousands of years. A 2001 study on homelessness issues in Europe noted that "Urban transience [e.g., homelessness] is different from nomadism/rootlessness or travelling..." in that nomads and Gypsy travelers in caravans have "planned mobility" rather than forced mobility. 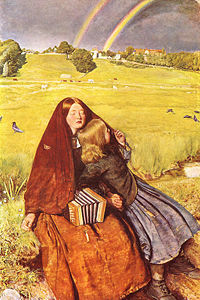 In Britain, most nomadic people are Roma (or Gypsy) people, Irish travelers, Kalé from North Wales, and Scottish travelers. Many of these people "... continue to maintain a semi-nomadic lifestyle and live in caravans"; however, "others have chosen to settle more permanently in houses." Some European countries have developed policies that acknowledge the unique nomadic (or "traveling") life of Gypsy people. Similar work has also been done by the Australian government, regarding the subgroup of Aboriginal people who are nomadic. In large Japanese cities such as Tokyo, the "many manifestations of urban nomadic" include day laborers and subculture groups. 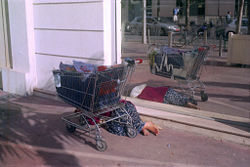 Homelessness has existed as serious a problem since urbanization and industrialization. In sixteenth-century in England, the state first tried to give housing to vagrants instead of punishing them, by introducing bridewells to take vagrants and train them for a profession. In the eighteenth century, these were replaced by workhouses, but these were intended to discourage too much reliance on state help. 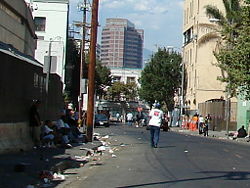 In most countries, many towns and cities had an area which contained the poor, transients, and afflicted, such as a "skid row." In New York City, for example, there was an area known as "the Bowery," where alcoholics were to be found sleeping on the streets, bottle in hand. 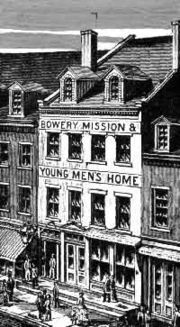 This resulted in rescue missions, such as the oldest homeless shelter in New York City, The Bowery Mission, founded in 1879 by the Rev. and Mrs. A.G. Ruliffson. The Community Mental Health Act of 1963 was a factor in setting the stage for homelessness in the United States. Long-term psychiatric patients were released from state hospitals into SROs and sent to community health centers for treatment and follow-up. It never quite worked properly and this population was largely found living in the streets soon thereafter with no sustainable support system. Also, as real estate prices and neighborhood pressure increased to move these people out of their areas, the SROs diminished in number, putting most of their residents in the streets. Other populations were mixed in later, such as people losing their homes for economic reasons, and those with addictions, the elderly, and others. In 1979, a New York City lawyer, Robert Hayes, brought a class action suit before the courts, Callahan v. Carey, against the city and state, arguing for a person's state constitutional "right to shelter." It was settled as a consent decree in August 1981. The city and state of New York agreed to provide board and shelter to all homeless men who met the need standard for welfare or who were homeless by certain other standards. By 1983 this right was extended to homeless women. By the mid-1980s, there was also a dramatic increase in family homelessness. Tied into this were an increasing number of impoverished and runaway children, teenagers, and young adults, which created a new sub-stratum of the homeless population. Also, in the 1980s in the United States, federal legislation was introduced for the homeless as a result of the work of Congressman Stewart B. McKinney. In 1987, the McKinney-Vento Homeless Assistance Act was enacted. The high cost of housing is a by-product of the general distribution of wealth and income. The rate of homelessness has also been impacted by the reduction of household size witnessed in the last half of the twentieth century. Some homeless individuals choose not to have a permanent residence, including travelers and those who have personal spiritual/religious convictions (as yogis in India). Most researchers feel the population of individuals who choose not to have a permanent residence is negligible. Many people who respond that they "prefer" the homeless lifestyle suffer from mental illness, trauma, or have adapted to the lifestyle and the response reflects a socially-desirable response or justification rather than having no real desire for stable shelter. Drug or alcohol misuse: It is not uncommon for homeless to suffer from a substance abuse problem. Debate exists about whether drug use is a cause or consequence of homelessness. However, regardless when it arises, an untreated addiction "makes moving beyond homelessness extremely difficult." Substance abuse is quite prevalent in the homeless population. Foster care background: This population experienced rates of homelessness nearly eight times higher than the non-foster care population. Escaping domestic abuse, including sexual, physical, and mental abuse: Victims who flee from abuse often find themselves without a home. Abused children also have a higher chance of succumbing to a drug addiction, which contributes to difficulties in establishing a residence. In 1990 a study found that half of homeless women and children were fleeing abuse. Civilian during war: Civilians during war or any armed conflict are also are at a higher risk for homelessness, because of possible military attacks on their property, and even after the war rebuilding their homes is often costly, and most commonly the government is overthrown or defeated which is then unable to help its citizens. Outdoors: In a sleeping bag, tent, or improvised shelter, such as a large cardboard box, in a park or vacant lot. "Hobo jungles": Ad hoc campsites of improvised shelters and shacks, usually near rail yards. Derelict structures: abandoned or condemned buildings, abandoned cars, and beached boats. Vehicles: cars or trucks are used as a temporary living refuge, for example those recently evicted from a home. Some people live in vans, covered pick-up trucks, station wagons, or hatchbacks. Public places: parks, bus or train stations, airports, public transportation vehicles (by continual riding), hospital lobbies, college campuses, and 24-hour businesses such as coffee shops. Some public places use security guards or police to prevent people from loitering or sleeping at these locations. Homeless shelters ranging from official city-run shelter facilities to emergency cold-weather shelters opened by churches or community agencies, which may consist of cots in a heated warehouse. Inexpensive boarding houses called “flophouses” offer cheap, low-quality temporary lodging. Friends or family: Temporarily sleeping in dwellings of friends or family members ("couch surfing"). Couch surfers may be harder to recognize than street homeless people. Homeless shelters are temporary residences for homeless people. Usually located in urban neighborhoods, they are similar to emergency shelters. The primary difference is that homeless shelters are usually open to anyone, without regard to the reason for need. Some shelters limit their clientele by gender or age. Most homeless shelters expect clients to stay elsewhere during the day, returning only to sleep, or if the shelter also provides meals, to eat; people in emergency shelters are more likely to stay all day, except for work, school, or errands. Some homeless shelters, however, are open 24 hours a day. There are daytime-only homeless shelters, where the homeless can go when they cannot stay inside at their night-time sleeping shelter during the day. Such an early model of a daytime homeless shelter providing multi-faceted services is Saint Francis House in Boston, Massachusetts. Homeless shelters are usually operated by a non-profit agency, a municipal agency, or associated with a church. Many get at least part of their funding from local government entities. Shelters can sometimes be referred to as "human warehouses." Homeless shelters sometimes also provide other services, such as a soup kitchen, job seeking skills training, job training, job placement, support groups, or substance abuse treatment. If they do not offer any of these services, they can usually refer their clients to agencies that do. There has been concern about the transmission of diseases in the homeless population housed in shelters, and the people who work there, especially tuberculosis. Health care for the homeless is a major public health challenge. Homeless people are more likely to suffer injuries and medical problems from their lifestyle on the street, which includes poor nutrition, substance abuse, exposure to the severe elements of weather, and a higher exposure to violence (robberies, beatings, and so on). Yet at the same time, they have little access to public medical services or clinics, in many cases because they lack health insurance or identification documents. There are many organizations providing free care all over the world for the homeless, but the services are in great demand given the limited number of medical practitioners helping. For example, it might take months to get a minimal dental appointment in a free-care clinic. Communicable diseases are of great concern, especially tuberculosis, which spreads in the crowded homeless shelters in high density urban settings. Many non-profit organizations such as Goodwill Industries maintain a mission to "provide skill development and work opportunities to people with barriers to employment," though most of these organizations are not primarily geared toward homeless individuals. Many cities also have street newspapers or magazines: publications designed to provide employment opportunities to homeless people or others in need. While some homeless have paying jobs, some must seek other methods to make money. Begging or panhandling is one option, but is becoming increasingly illegal in many cities. Despite the stereotype, not all homeless people panhandle, and not all panhandlers are homeless. Another option is busking: performing tricks, playing music, drawing on the sidewalk, or offering some other form of entertainment in exchange for donations. In cities where pharmaceutical companies still collect paid blood plasma, homeless people may generate income through frequent visits to these centers. Homeless people have been known to commit crimes just to be sent to jail for food and shelter. In police slang, this is called "three hots and a cot" referring to the three hot daily meals and a cot to sleep on given to prisoners. Similarly a homeless person may approach a hospital's emergency department and fake a physical or mental illness in order to receive food and shelter. Several organizations in major cities have tried to be inventive about help to the swelling number of homeless people. In New York City, for example, in 1989, the first street newspaper was created called Street News which put some homeless to work, some writing, producing, and mostly selling the paper on streets and trains. It was written pro bono by a combination of homeless, celebrities, and established writers. In 1991, in England, a street newspaper, following on the New York model was established, called The Big Issue and was published weekly. Its circulation grew to 300,000. Chicago has StreetWise which has the largest circulation of its kind in the United States, 30,000. Boston has a Spare Change newspaper built on the same model as the others: homeless helping themselves. More recently, Street Sense in Washington, D.C. has gained a lot of popularity and helped many make the move out of homelessness. Students in Baltimore, Maryland have opened a satellite office for that street paper as well. The number of homeless people worldwide has grown steadily in recent years, as has a rash of violent crimes against the homeless. In some Third World nations such as Brazil, India, Nigeria, and South Africa, homelessness is rampant, with millions of children living and working on the streets. Homelessness has become a problem in the cities of China, Thailand, Indonesia, and the Philippines despite their growing prosperity, mainly due to migrant workers who have trouble finding permanent homes and to rising income inequality between social classes. It is estimated that $19 billion a year is needed to end hunger associated with homelessness. ↑ Office of Applied Studies, United States Department of Health and Human Services, Terminology. Retrieved July 3, 2007. ↑ "Not Homeless-Just Houseless," United States Department of Housing and Urban Development. Retrieved July 3, 2007. ↑ Sarah Dar, “Migration and Settlement: Migration as a Way of Life,” Connecting Histories. Retrieved August 30, 2007. ↑ Molloy, “Accommodating Nomadic, Belfast: Traveler Movement Northern Ireland” in At What Cost: The Economics of Gypsy and Traveller Encampments, Edited by Rachel Morris and Luke Clements (Bristol: The Policy Press, 2002, ISBN 1861344236). ↑ The Bowery Mission. Retrieved August 30, 2007. ↑ Todd Depastino, "Citizen Hobo: How a Century of Homelessness Shaped America." Retrieved August 30, 2007. ↑ D. J. Scherl and L. B. Macht, "Deinstitutionalization in the absence of consensus," Hospital and Community Psychiatry 9 (Sept. 30, 1979): 599-6040 PubMed. Retrieved August 30, 2007. ↑ D. A. Rochefort, "Origins of the 'Third psychiatric revolution': the Community Mental Health Centers Act of 1963," Journal of Health Politics, Policy and Law 9(1) (Spring 1984): 1-30. Abstract available online. Retrieved August 30, 2007. ↑ S. Feldman, "Out of the Hospital, Onto the Streets: The Overselling of Benevolence," Hastings Center Report 13(3) (June 1983): 5-7. Abstract available online. Retrieved August 30, 2007. ↑ United States Conference of Mayors, "A Status Report on Hunger and Homelessness in America's Cities: A 27-city Survey," December 2001. ↑ “Domestic Violence and Homelessness,” National Coalition for the Homeless (June 2005). Retrieved August 30, 2007. ↑ "Occupational Exposure to Tuberculosis," OSHA Notice. Retrieved August 30, 2007. ↑ Health Care Justice, National Coalition for the Homeless. Retrieved August 30, 2007. ↑ Dana Harman, "Read all about it: Street papers flourish across the US," Christian Science Monitor (November 17, 2003). Retrieved August 30, 2007. ↑ "Hate, Violence, and Death on Main Street USA: A report on Hate Crimes and Violence Against People Experiencing Homelessness, 2006," National Coalition for the Homeless, February 2007. Retrieved August 30, 2007. ↑ The Borgen Project. Retrieved August 30, 2007. Baumohl, Jim (ed.). "Homelessness in America." Phoenix: Oryx Press, 1996. "Warning over homelessness figures." BBC News (June 13, 2005). Retrieved August 30, 2007. "No Home, a season of television and radio programmes that introduce the new homeless." BBC Radio 4. 2006. Retrieved August 30, 2007. Booth, Brenda M., J. Greer Sullivan, Paul Koegel, M. Audrey Burnam. "Vulnerability Factors for Homelessness Associated with Substance Dependence in a Community Sample of Homeless Adults." RAND Research Report. Originally published in American Journal of Drug and Alcohol Abuse 28(3) (2002): 429-452. Retrieved August 30, 2007. Crimaldi, Laura. "Homeless getting new lease on life." Boston Herald (December 11 2006). Culhane, Dennis. 2001. "Responding to Homelessness: Policies and Politics." Retrieved August 30, 2007.
deMause, Neil. "Out of the Shelter, Into the Fire." The Village Voice (June 20, 2006). Retrieved August 30, 2007. Duffy, Gary. "Brazil's homeless and landless unite." BBC News (April 17, 2007). Retrieved August 30, 2007. Kahn, Ric. "Buried in Obscurity." Boston Globe (December 17, 2006). Retrieved August 30, 2007. Riis, Jacob. 1890. How the Other Half Lives. Available online from Yale University. Retrieved August 30, 2007. Schutt, Russell K., et al. 1987. "Boston's Homeless, 1986-1987: Change and Continuity." Retrieved August 30, 2007. Schutt, Russell K. 1988. “Working with the Homeless: the Backgrounds, Activities and Beliefs of Shelter Staff.” Retrieved August 30, 2007. Schutt, Russell, K. 1990. "Homeless Adults in Boston in 1990: A Two-Shelter Profile." Retrieved August 30, 2007. Schutt, Russell K., and Francine Byrne, et al. 1995. "City of Boston Homeless Services: Employment & Training for Homeless Persons." Retrieved August 30, 2007. Schutt, Russell K., and James Feldman, et al. 2004. "Homeless Persons’ Residential Preferences and Needs: A Pilot Survey of Persons with Severe Mental Illness in Boston Mental Health and Generic Shelters." Retrieved August 30, 2007. Sommer, Heidi. 2001. "Homelessness in Urban America: A Review of the Literature." Retrieved August 30, 2007. St. Mungo's Organisation (UK). "A Brief History of Homelessness." Retrieved August 30, 2007. United States Conference of Mayors. 2005. "Hunger and Homelessness Survey." Retrieved August 30, 2007. Vissing, Yvonne. "The $ubtle War Against Children." Fellowship (March/April 2003). Retrieved August 30, 2007. This page was last modified on 13 January 2016, at 16:57.